The Shenandoah University women’s soccer team may not be at the top of the Old Dominion Athletic Conference (ODAC), but they do have something going for them. The Lady Hornets are one of the youngest teams in the conference, with 12 freshmen on the 23-player roster. There is not a single senior on the team and only three juniors. Of those three juniors, only one is a regular starter. 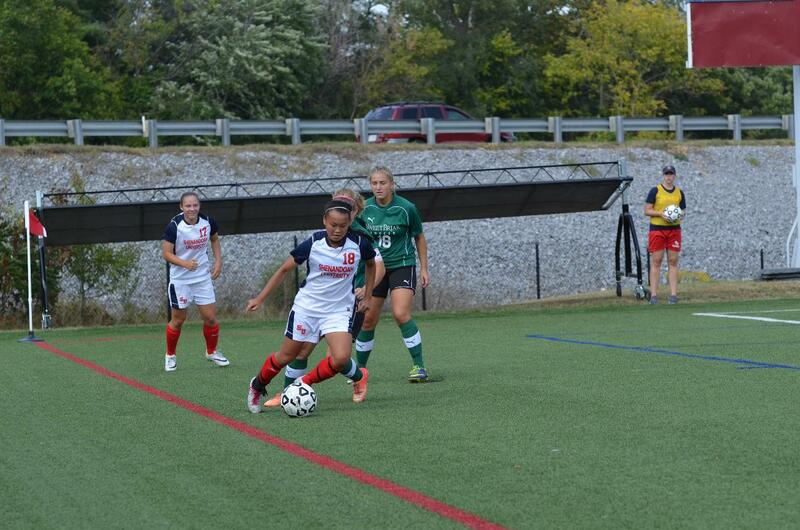 Danielle Burris is the sole upperclassman in the starting lineup, and is also a team captain. Burris and fellow junior, co-captain Nicole Pratt, hope to use their experience to lead the young squad. “They are both good captains, and they love to motivate us on and off the field,” said sophomore Lizzy Bellido. Pratt and Burris will have their work cut out for them trying to unite a team of young, inexperienced players after graduating five seniors in May. Head coach Elizabeth Pike said she is optimistic about the future of this young, inexperienced team. “We’re a young team, and we normally have six or seven freshmen starting a game,” Pike said. While this season may at times be tumultuous, Pike views it as more of a building year where the young players can learn to work together on the field. The Hornets’ record of 3-6-1 indicates a team that is struggling, but numbers don’t accurately tell the entire story. All three wins came in conference play, where they have only lost one match. Now that only conference matchups lay ahead, the team hopes to maintain its form and even improve upon last season’s performance, when the Lady Hornets made it to the ODAC semifinals. Fortunately for the young players, Pike is not solely focused on wins. She wants the team to learn from losses. “We need to score more goals, and work harder to generate more of an attack,” Bellido echoed, singling out the midfield that she is a part of. It may not be a celebratory season, but the Lady Hornets are focused on building upon raw talent and using every match to improve upon facets of their game. The metric for success this season may not be wins, but as the roster grows together, they hope to continue improving and mold better players. With an up and down season already in the works, the S.U. women’s soccer team is hoping to come together and build on a raw talent to create a team that will succeed both now and in the future.